Ready to learn about your home? Let’s get started. Every home has a unique story. Whether it’s a 120 year old saltbox, a newly renovated ranch, an iconic 1950’s Cape or a brand new townhouse, Reveal Home Inspection, LLC identifies clues that help tell your home’s story, provides an accurate assessment of the condition of the property and gives you the knowledge to make informed decisions. We do this in a thorough, efficient, timely, non-alarming manner that meets your time-table. Just as each home has a story…so do people….first time home-buyer’s may need extra attention, seller’s want to know what needs repair and to avoid last-minute surprises and price reductions, investment property buyer’s may be mostly concerned with any major safety issues for renters, or if doing a full-rehab and flip, exactly what they’re getting for their money, seasoned buyer’s have learned from the past want to conduct their due diligence on items that need attention. We know HOMES..and just as importantly…we know PEOPLE. We think you’ll like the “Reveal” difference! 50 years combined construction, inspection, electrical and teaching experience. We know homes, but more importantly…we know people! NH licensed home inspectors, InterNACHI certified, ASHI members, insured & background verified. More quality time spent with you before, during and AFTER the inspection…we take extra time to educate, recommend and refer in an upbeat, clear, non-alarming manner. We’re interested in YOUR inspection…not looking at our watches! We “Reveal” what you may not/don’t see: structural defects, radon/ CO gas, electrical problems, insect damage, hidden moisture and energy concerns, safety hazards. Our entire reputation is built on our NAME and this process! We’re a screened & approved Home Advisor Pro business . Check us out on Angies List and Facebook also! ​Time is short. We use advanced reporting software to deliver our interactive inspection reports within 24 hours of the inspection. Our goal at Reveal Home Inspection, LLC is to provide our customer’s with an easy, seamless experience throughout the entire inspection process, while providing the most thorough, efficient and timely inspection and easy-to-understand report. We achieve this by utilizing innovative approaches, state-of-the art inspection tools and reports, with a commitment to customer education, our own continuing education and an unwavering commitment to industry ETHICS and STANDARDS. …short-notice, weekends, early evenings…call us! …more detailed, efficient, timely, educational…realtor’s love it, you’ll love it! …thermal imaging, insect inspection/report, moisture intrusion test, home maintenance manual & more included in our “standard” inspection. …from scheduling to payment to report delivery…our system saves you time and extra steps. 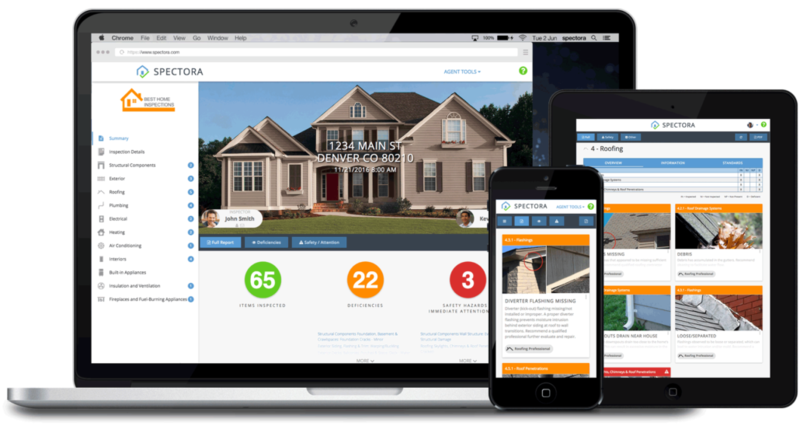 ..easy to read Spectora report with actionable steps, color photos, maintenance tips…all delivered electronically within 24 hours. Email & phone support following inspection for questions & concerns.